Expresses “leaking” between channels; it is measured by driving a stimulus signal in one channel while listening to the other. Crosstalk is expressed as a ratio between the quiet undriven channel and the stimulus in the driven channel, and given in decibels. In stereo system, crosstalk is measured by driving a stimulus signal in one channel while listening to the other, therefore measuringing the amount of unwanted signal coupling. As the signal level is very small, sharp bandpass filter is used for the receiving channel – otherwise the signal would likely be below noise floor. The result is given in decibels as a ratio between the quiet undriven channel and the stimulus in the driven channel. Signal frequency must be given when stating crosstalk. These numbers are taken from the plot below. Crosstalk usually increases in higher frequencies as capacitive coupling increases. It is also typical to have differences between channels. Crosstalk is one of the basic measurements on audio systems although it rarely causes any issues with modern high quality audio components. 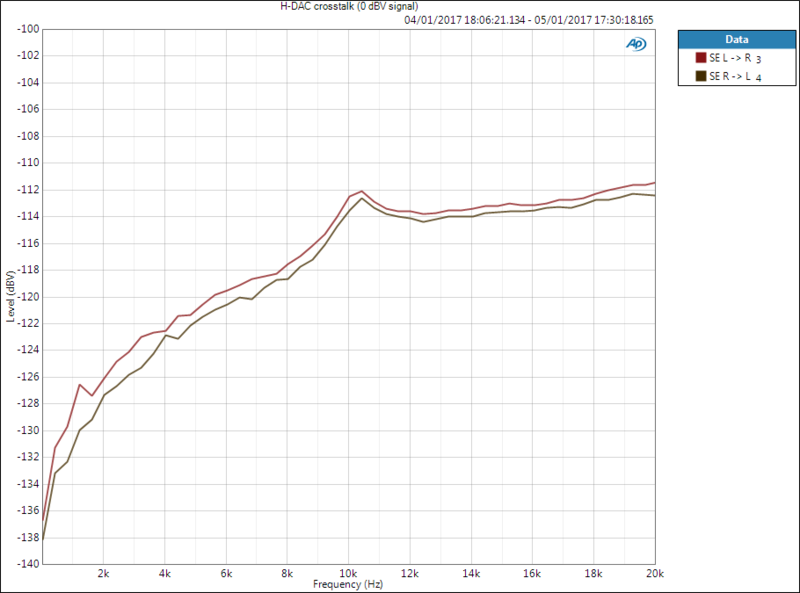 Note that units in graph below are not dB; however, as signal level is 0 dBV the dB-value can be read directly. I have also used the worst of the two channels which may not always be the case.